Alex Garland has made a name for himself as a screenwriter, penning the scripts for movies like Dredd, and especially his collaborations with Danny Boyle, including 28 Days Later, The Beach, and Sunshine. 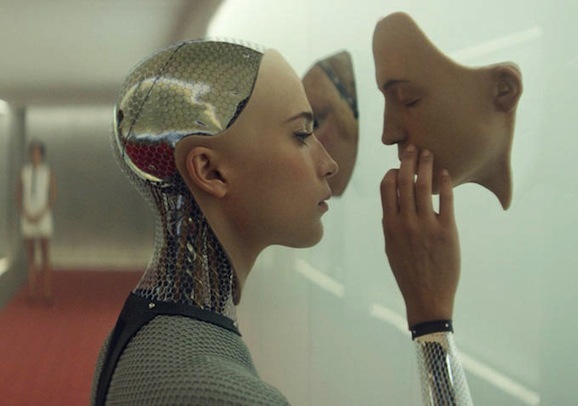 However, his upcoming directorial debut, Ex Machina has us more excited than any of his previous projects. It’s been on our radar for quite some time, but now we know who will distribute it, as well as when we’ll finally see it, and there are two new posters to boot. A24, the folks responsible for bringing the likes of The Rover, Life After Beth, and Under the Skin, as well as many others, to theaters this year, picked up the rights to Garland’s film, not to be confused with Bryan K. Vaughn’s excellent comic of the same name. 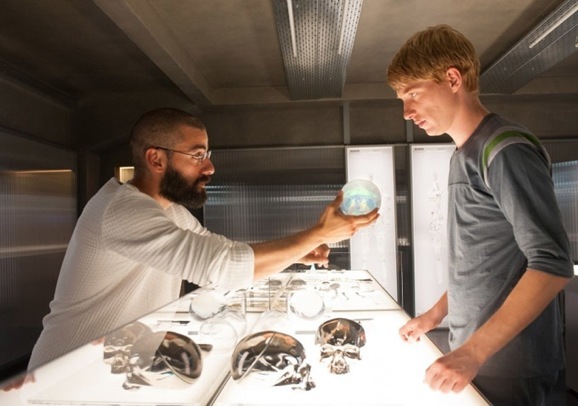 We’ve seen a few scattered, random stills from the film, and it’s stars have talked about it from time to time in interviews, but now we know that A24 plans to release Ex Machina on April 10, 2015. We’ve been keeping tabs on Ex-Machina since we first heard about more than year and a half ago. It sounded promising, and only got more intriguing as we heard additional details and saw the cast they put in place. But we haven’t heard anything since back in April, and we were hoping it might make an appearance at one of the fall festivals (it sounds tailor made for the midnight section of the Toronto International Film Festival or the genre heavy Fantastic Fest). But alas, it was not to be. Still, we did get a cool new still from the film, and it only serves to get us even more excited for this. Ex-Machina marks the directorial debut of Alex Garland, who, though he hasn’t helmed a feature film before, is definitely an industry veteran. He’s written a number of movies for Danny Boyle, including 28 Days Later, The Beach, and Sunshine, and outside of that partnership, he is even behind the script for Pete Travis’ recent cult fave Dredd. We haven’t heard much from Alex Garland’s directorial debut, the psychological robot thriller Ex Machina, for almost a year. The last news we heard about the film involved putting the final casting in place. Production has apparently passed rather smoothly, since now we’ve got our first look at the finished product, as well as an official synopsis. Garland is most widely known as a writer. He penned such notable genre favorites as 28 Days Later, Sunshine, and Dredd. For his first turn behind the camera he’s assembled a cast that is headed by Oscar Isaac (Inside Llewyn Davis), Domhnall Gleeson (About Time), and Alicia Vikander (The Fifth Estate). This is the second time Gleeson and Vikander have worked together, as both appeared in Joe Wright’s 2012 adaptation of Leo Tolstoy’s Anna Karenina. 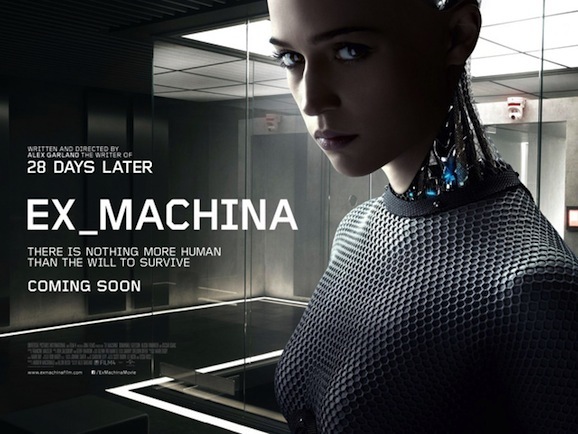 Alex Garland’s (28 Weeks Later) upcoming robotic thriller Ex-Machina is rounding out its cast nicely. Alicia Vikander, who recently starred in last year’s adaptation of Leo Tolstoy’s Anna Karenina, is the latest acquisition, signing on to play the female lead. Vikander joins a cast that already includes Oscar Isaaac (Inside Llewyn Davis) and Domhnall Gleeson (Harry Potter and the Deathly Hallows), who also appeared in Anna Karenina. Here’s the kicker: the Swedish actress’ role isn’t your traditional female lead. She’ll follow in the footsteps blazed by Sean Young in Blade Runner and play a highly advanced, artificially intelligent humanoid robot. The story centers around a young billionaire computer programmer (Isaac). He specifically selects one of his up-and-coming employees, played by Gleeson, to spend a week at his compound in order to participate in an experiment involving his latest project. Turns out, however, that this new endeavor is Vikander’s aforementioned female mechanoid. Without a ton of specific details, there are a variety of directions that this story can go. Perhaps the rich guy’s creation will escape and run amok. Maybe the new guy will fall in love with robot and they’ll run away together. No matter where the narrative goes, you can’t help but walk away from this description with a serious Dr. Frankenstein vibe from the proceedings. Director Alex Garland and producer Scott Rudin’s indie robot thriller Ex Machina has roped in a pair of actors as co-conspirators. Oscar Isaac (The Bourne Legacy) and Domhnall Gleeson (Harry Potter and the Deathly Hallows, Dredd) are both in talks to join the party. Also written by Garland (28 Days Later, Sunshine), who is making his directorial debut, Ex Machina is about a billionaire programmer who selects an employee to take part in a test run of his most recent invention. Turns out this super-secret project is an artificially intelligent female robot. As you may have gathered, this Ex Machina has nothing to do with Brian K. Vaughan’s comic book of the same name — where a superhero becomes mayor of New York City after 9/11—which is also in development. I’m excited about that one, too. Most recently, Garland penned the underappreciated-in-theaters Dredd. Part of me hopes this takes a Weird Science-style turn into shenanigans, but given Garland’s history of darkness and violence, that’s probably not the way this will all shake out. Still, that’s a grand idea, and in Garland’s hands, he’ll likely be able to pull off something kickass.